Yohander Manuel (Ortega) Mendez…favorite vacation spot is Virgin Islands and favorite player growing up was Endy Chavez…also played basketball in his youth…signed by Rafic Saab, Pedro Avila, and Mike Daly. Tossed a career-best 150.0 innings between the majors and minors, including a career-high 27.2 innings at the Major League level…opened the season at Triple-A for the 1st time in his career and had a pair of stints with the Rangers prior to the All-Star break…following an option to the minors on 6/19, he climbed 3 levels of the Texas farms system to return to the Rangers in September. Had 3 stints with Texas: 5/3-12, 6/15-18, and 9/2-end of season… had 6 games/4 starts after his Sept. promotion, going 2-1, 4.13 (11 ER/24.0 IP)…his 2 wins came in scoreless outings on 9/2 vs. MIN (6.0 IP in start) and 9/14 at SD (5.0 IP in relief), the latter being a game in which Texas used an 'opener'…the victory against the Twins was his 1st ML win…joined Ariel Jurado (3) and Mike Minor (2) as the only Rangers with multiple wins in Sept…was scratched from scheduled start for TEX on 6/20 at KC and optioned to minors on 6/19. Went 0-1, 5.11 (7 ER/12.1 IP) in 7 relief outings for the Rangers after he was recalled from Frisco (AA) on 9/4… allowed runs in 4 of 7 outings for Texas…2nd straight year as a September call-up…finished season with 2 longest outings of his brief ML career: 4.2 IP in season finale on 10/1 vs. OAK, and 3.2 IP on 9/26 vs. HOU…1st ML loss, 9/15 at LAA (BB to only BF), 1st Ranger to take loss when walking only BF since Juan Alvarez on 7/28/02 vs. OAK. FRISCO // Spent balance of season at Frisco, his 1st extended action at the Double-A level…finished 7-8, 3.79 (58 ER/137.2 IP) in 24 G/GS…had 1.140 WHIP and averaged 8.1 SO/9, as opponents batted just .228 (114-499)…established career highs for starts, innings, and strikeouts (124), also posted career highs in HR (23) and HR/9 (1.5)…led the RoughRiders in stirkeouts and was 3rd in innings…went 2-2, 3.12 (15 ER/43.1 IP) in 1st 7 starts through 5/12, then 5-6, 4.10 (43 ER/94.1 IP) in final 17 outings…pitched season-high 7.0 innings on 6 occasions, allowing one-or-zero runs in each contest, going 4-0 in those games…totaled 9 quality starts, with high game score of 78 coming both 4/25 at San Antonio (7.0 IP, 1 H, 1 R-0 ER) and 6/20 vs. Midland (7.0 IP, 3 H, 0 R)…permitted multiple HR 5 times, this after just one previous instance as a pro, including career-high 4 HR allowed on 4/30 at Corpus Christi. Recalled from Round Rock (AAA) on 9/2 near end of minor league season, he made 2 relief appearances for Texas to finish the year…made ML debut on 9/5 at SEA (1.0 IP, 4 H, 5 R-ER), and also pitched on 9/17 vs. OAK (2.0 IP, 1 H, 1 R-ER)… at 21 years, 232 days old, was youngest Rangers pitcher to make ML debut since Martin Perez (21.084 on 6/27/12 vs. DET). Spent the season with Hickory (A), going 3-3 with 3 saves and a 2.44 ERA (18 ER/66.1 IP) in 21 games/8 starts, establishing career bests in games and innings…had a 1.085 WHIP and averaged career-high 10.0 strikeouts per 9 innings…had career-best 74 K's against 15 BB…was 2-2, 2.94 (11 ER/33.2 IP) in 8 starts and 1-1, 1.93 (7 ER/32.2 IP) in 13 relief outings…opponents batted .230 (57-248), just .211 (15-71) by LHB…only HR allowed all year came in his final 2 outings, 8/23 at Greensboro and 9/1 at Delmarva… club's minor league reliever of the month for May, when he posted 16.2 scoreless innings over 8 relief outings in his 1st action of the season…was scoreless in 1st 11 G/one start overall spanning 24.1 innings, 1st runs allowed in start on 6/28 vs. Lakewood…selected for league All-Star Game on 6/23 in Asheville, allowing an unearned run in 0.2 IP to finish win for the North squad…started twice in Hickory's 6-game run to the South Atlantic League championship, going 1-1, 2.70 (3 ER/10.0 IP) with 2 BB and 13 SO… earned win on 9/17 at Asheville to finish a 3-game sweep in SAL final round. Limited to 10 G/9 GS with Hickory and AZL Rangers due to a nearly 4-month stay on the disabled list with left shoulder strain…combined to go 3-1, 2.70 (11 ER/36.2 IP) in 10 G/9 GS, career bests in WHIP (1.036) and SO/BB (8.75)…chosen as the SAL Pitcher of the Week for 4/14-20 after 6.0 scoreless innings and 10 strikeouts on 4/18 at Asheville… on Hickory DL, 4/24-8/21…made 3 rehab appearances with the AZL Rangers from 8/8-15. Limited to 8 starts with Spokane, spending the final month of the season on the disabled list…highest WHIP (1.440) in any pro season…was placed on disabled list 7/31 for remainder of the year with a left elbow sprain. Spent 1st professional season with DSL Rangers…tied for the team lead in starts, while recording the 3rd-lowest ERA on the staff…career-low 1.99 ERA, and allowed just one HR in 45.1 IP. Did not see official action after signing 1st professional contract on July 2. April 1, 2019 Texas Rangers transferred LHP Yohander Mendez from the 10-day injured list to the 60-day injured list. Strained right elbow. 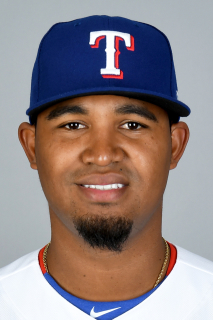 March 28, 2019 Texas Rangers placed LHP Yohander Mendez on the 10-day injured list. Right UCL sprain. November 5, 2018 LHP Yohander Mendez assigned to Navegantes del Magallanes. September 2, 2018 Texas Rangers recalled LHP Yohander Mendez from Round Rock Express. August 22, 2018 LHP Yohander Mendez assigned to Round Rock Express from Frisco RoughRiders. July 16, 2018 LHP Yohander Mendez assigned to Frisco RoughRiders from Down East Wood Ducks. June 25, 2018 LHP Yohander Mendez assigned to Down East Wood Ducks from Round Rock Express. June 19, 2018 Texas Rangers optioned LHP Yohander Mendez to Round Rock Express. June 15, 2018 Texas Rangers recalled Yohander Mendez from Round Rock Express. May 13, 2018 Texas Rangers optioned LHP Yohander Mendez to Round Rock Express. May 3, 2018 Texas Rangers recalled Yohander Mendez from Round Rock Express. March 18, 2018 Texas Rangers optioned LHP Yohander Mendez to Round Rock Express. September 4, 2017 Texas Rangers recalled Yohander Mendez from Frisco RoughRiders. August 11, 2017 Frisco RoughRiders activated LHP Yohander Mendez from the 7-day disabled list. August 3, 2017 Frisco RoughRiders placed LHP Yohander Mendez on the 7-day disabled list retroactive to July 29, 2017. March 28, 2017 LHP Yohander Mendez assigned to Frisco RoughRiders from Round Rock Express. March 7, 2017 Texas Rangers optioned LHP Yohander Mendez to Round Rock Express. October 11, 2016 Yohander Mendez roster status changed by Texas Rangers. October 6, 2016 Texas Rangers reassigned LHP Yohander Mendez to the minor leagues. September 2, 2016 Texas Rangers recalled LHP Yohander Mendez from Round Rock Express. August 3, 2016 LHP Yohander Mendez assigned to Round Rock Express from Frisco RoughRiders. July 11, 2016 LHP Yohander Mendez assigned to Frisco RoughRiders from Round Rock Express. July 5, 2016 LHP Yohander Mendez assigned to Round Rock Express from Frisco RoughRiders. May 20, 2016 LHP Yohander Mendez assigned to Frisco RoughRiders from High Desert Mavericks. March 29, 2016 LHP Yohander Mendez assigned to High Desert Mavericks. March 14, 2016 Texas Rangers optioned LHP Yohander Mendez to Frisco RoughRiders. November 20, 2015 Texas Rangers selected the contract of Yohander Mendez from Hickory Crawdads. October 7, 2015 LHP Yohander Mendez assigned to Navegantes del Magallanes. May 1, 2015 LHP Yohander Mendez assigned to Hickory Crawdads from AZL Rangers. April 7, 2015 LHP Yohander Mendez assigned to AZL Rangers from Hickory Crawdads. August 22, 2014 Hickory Crawdads activated LHP Yohander Mendez from the 7-day disabled list. August 8, 2014 Hickory Crawdads sent LHP Yohander Mendez on a rehab assignment to AZL Rangers. April 27, 2014 Hickory Crawdads placed LHP Yohander Mendez on the 7-day disabled list. March 31, 2014 LHP Yohander Mendez assigned to Hickory Crawdads from Spokane Indians. September 27, 2013 Spokane Indians activated LHP Yohander Mendez from the 7-day disabled list. July 31, 2013 Spokane Indians placed LHP Yohander Mendez on the 7-day disabled list. June 14, 2013 LHP Yohander Mendez assigned to Spokane Indians. June 2, 2012 LHP Yohander Mendez assigned to DSL Rangers. June 1, 2012 Texas Rangers signed free agent LHP Yohander Mendez to a minor league contract.